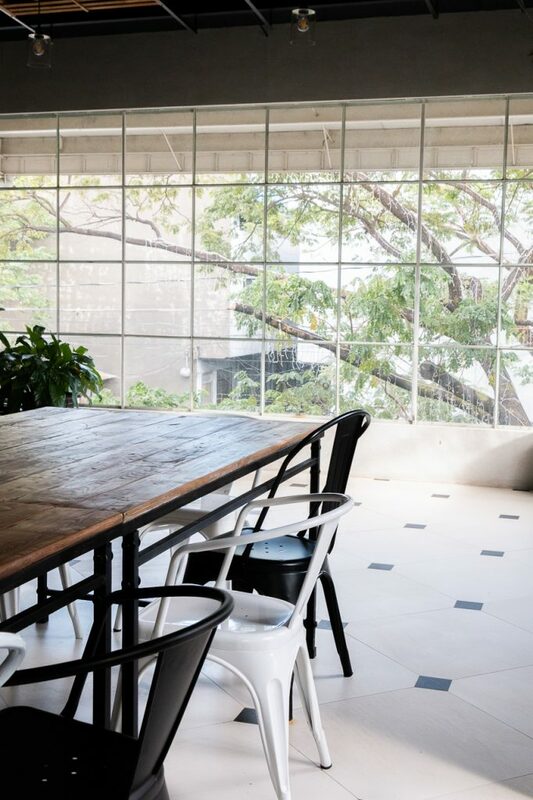 One of the newest restaurants to join the row of under the radar food joints you can find along the stretches of Gil Fernando Avenue in Marikina is Treehouse Village. 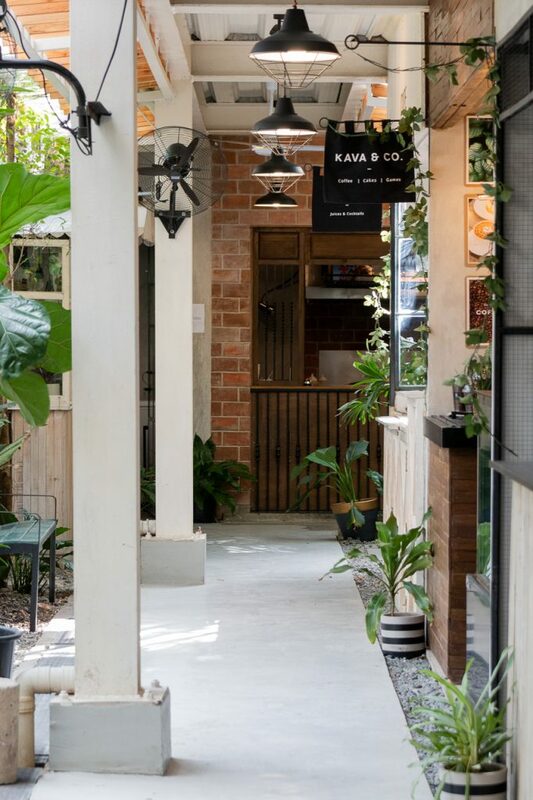 You are greeted with a bar once you enter; turn left to the lush patio where you’d catch sight of a few food kiosks by the names of Jooze, Kava & Co., and three unnamed stalls. But the bi-level establishment isn’t a food park, though at first glance it may seem to be. 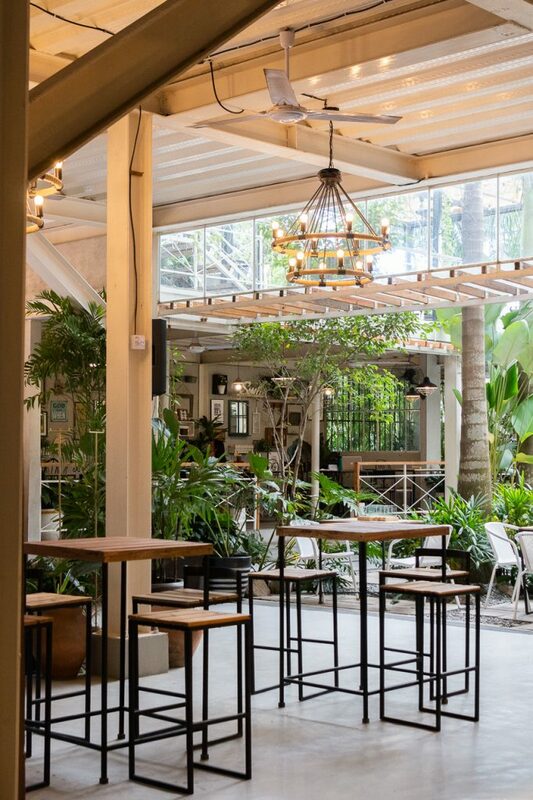 As its name suggests, it’s actually a casual dining and events place with a part-tropical, part-rustic theme going on. There’s no need to go through each stall to place an order because the kiosks and Treehouse itself are owned and managed by the same family. This means that you can just choose your food and drink of choice from the comforts of your table. The open-air dining areas are surrounded with lots of plants so you wouldn’t have to worry about the place being too hot (I suggest getting a table upstairs for cooler winds). At the second level, you’d also find small- to mid-sized (40 to 100 pax) function rooms to cater to private parties. The grand hall downstairs, which can accommodate a maximum of 200 people, is nearing its construction completion. 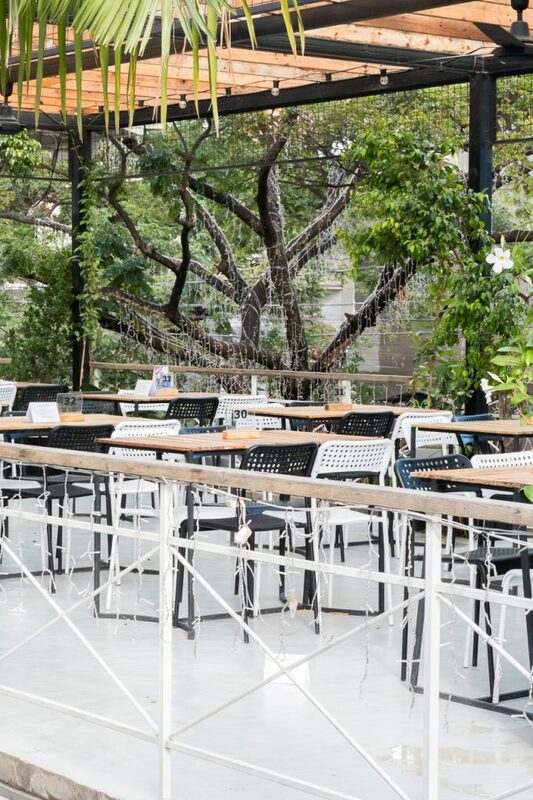 The unnamed stalls are merely fronts for Treehouse’s resident restaurant named Diorella’s. Their menu features a wide array of comfort food ranging from international to local cuisine. 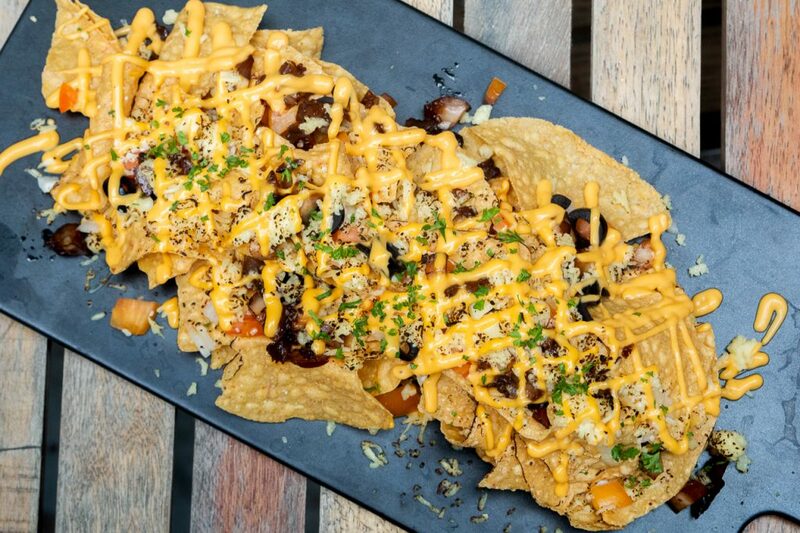 We had an overwhelmingly generous serving of nachos as our appetizer and it’s no wonder why the dish is a hit with Treehouse’s clientele. For one, the crispy tortilla chips are loaded with cheddar cheese, shredded chicken barbecue, olives, and salsa. But what makes the dish extra flavorful is the mozzarella sitting on top that’s torched to perfection. 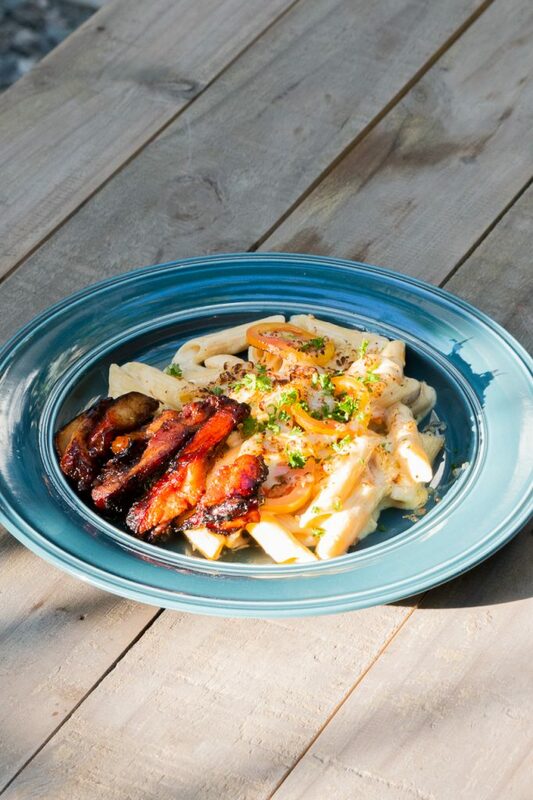 Nicole Aguilar, one of Treehouse’s owners, conceptualized a large chunk of the menu and pasta dishes are her specialties. We had the truffle chicken pasta as our next course. The homemade sauce is exceptionally creamy without being too sweet and makes a great complement to the rather sweet chicken barbecue. 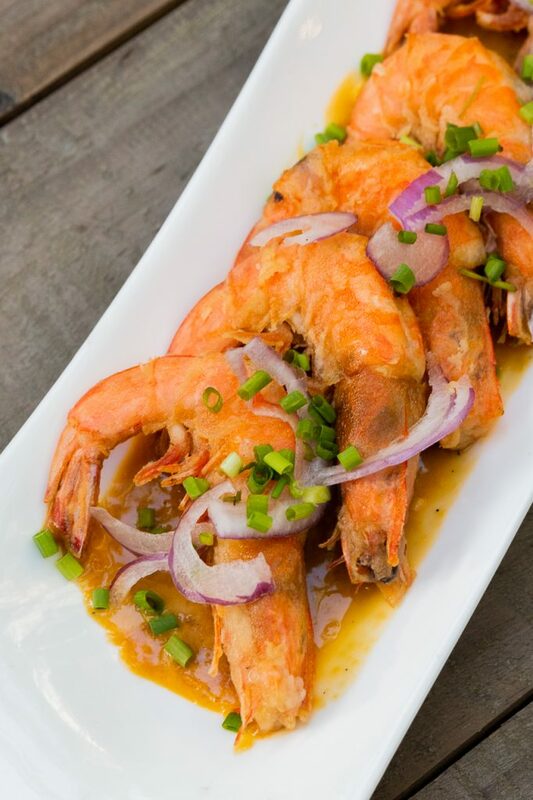 Diorella’s also doesn’t miss out on the salted egg fad with their special shrimp fare tossed in homemade salted egg sauce. As a big fan of shrimp and a salted egg hater, I wasn’t sure how I’d react to the dish at first. But I found the sauce surprisingly grainy yet subtle, to my delight. For dessert, you can either choose to get something from Diorella’s creamy Bataan ice cream selection or something off Kava & Co. The latter is a coffee shop that serves cakes as well. 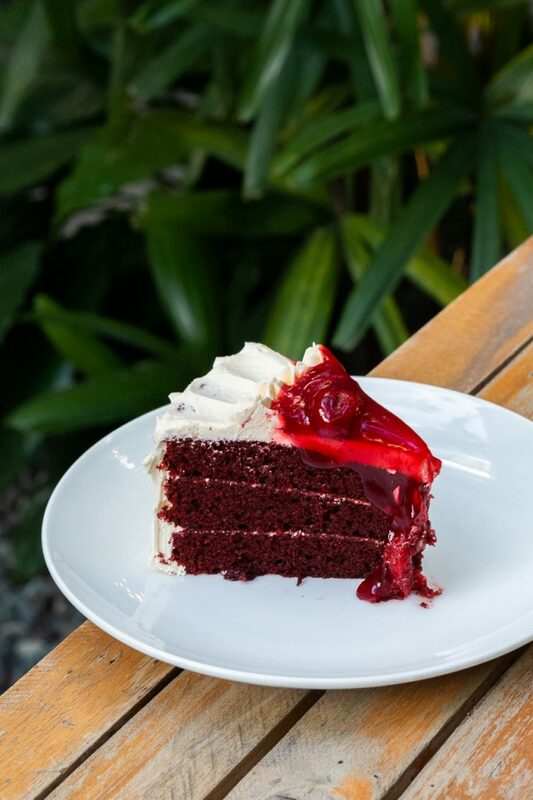 The red velvet cake, for example, has a strawberry jam finish on top though I feel that the cream cheese would’ve sufficed. If you fancy to have an after-dinner chillnuman session, Jooze and the bar has a wide selection of alcoholic and non-alcoholic drinks. 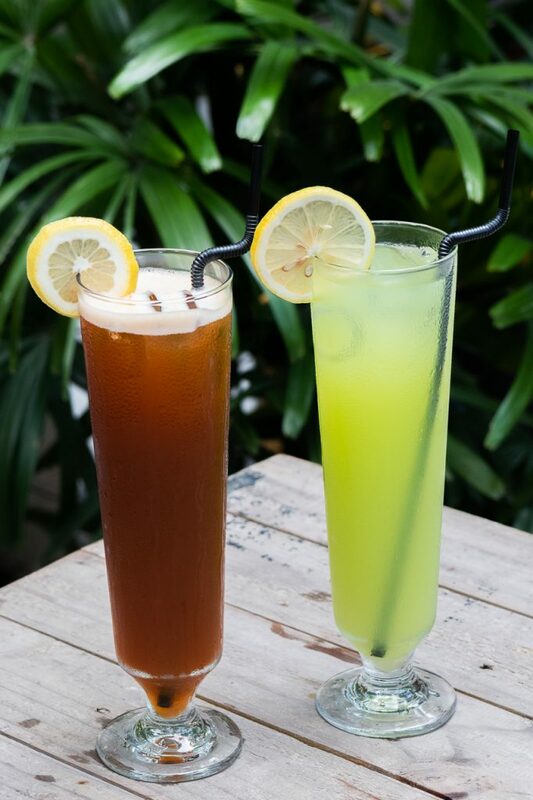 The iced tea and cucumber lemonade had just the right amount of sweetness to go with any meal. Other than its refreshing ambience, go for the creamy truffle chicken pasta.